System 65 Guitar Maintenance Kit contains one each of every one of Dunlop's guitar care products, along with instructions, microfine fret polishing cloth, and two 100% cotton cloths. Perfect for gift giving! This remarkable polish was specially formulated after the consultation of chemists, players, techs, luthiers, and musicians. Dunlop Formula No. 65 Polish and Cleaner has been created to provide optimum cleaning, exceptional shine and incredible protection. It is safe and easy to use. Dunlop Formula No.65 is made without harsh chemicals or ingredients. The results--the difference between acceptable and exceptional. "If you want your guitar to shine, get the Dunlop 65 System!!!" Sound: N/A Feature: Comes with everytheing you need to clean your guitar Quality: Great Value: Great value,I would pay twice as much. Kit lasts for quite a long time. Manufacturer Support: N/A The Wow Factor: I really needed this for my guitar. I had no idea how dirty my guitar was until I saw how clean it was after using this product! Overall: Love the product. 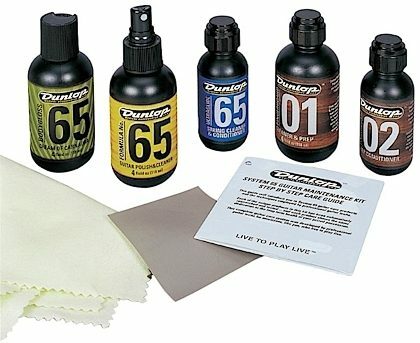 If you want your guitar to shine, get the Dunlop 65 System!!! 43 of 46 people (93.48%) found this review helpful. Did you? 24 of 27 people (88.89%) found this review helpful. Did you?